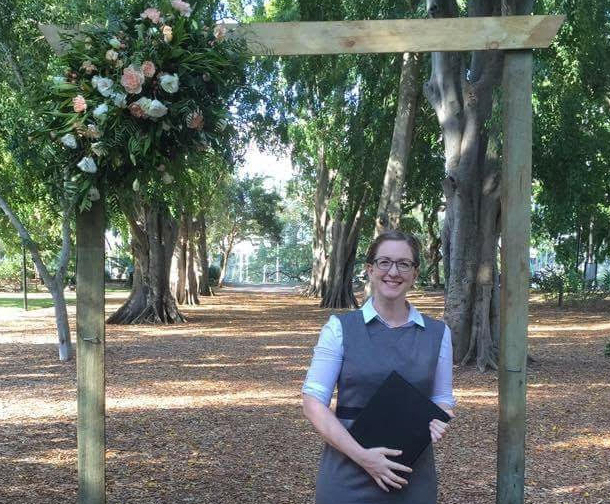 I became a registered Celebrant in 2015, after many years of consideration. Now I have no idea why I took so long to do it! Bringing people together on some of the most important and memorable days of their lives is something that I am so privileged to be able to take part in. I love using my aptitude for words and feelings to write personalised and exciting scripts for ceremonies. My background as a Registered Nurse has given me a love of working with people, a fondness for paperwork (strange, I know, but extremely important in both of these vocations) and a real desire and passion for doing things that make people happy. I live with my family in Brisbane’s Bayside and have done for the last 28 years. I do love coffee and good food… a lot. I also have an inherent love for musical theatre. I am serious about my work but also love to have a good laugh and a lot of fun. I’m not scared of trying something different, so if you have a bit of an “out-there” idea for your ceremony, I am going to be excited to hear it! I truly believe in the power of love (it’s not just a great song!) and feel very fortunate to be able to create truly individual ceremonies, whether it’s a celebration of love between a couple, to welcome a new baby or for loved ones who have passed. New photos and information are added to the website regularly, and please feel free to contact me using the details on the contact page or via the link to my facebook page below. Please also head to my Facebook and Instagram pages for frequent updates, and a further glimpse into my life as a Celebrant. Thank you for taking the time to check out my website, and I hope to meet you sometime soon.